When you’re just going out for a little while, small travel humidors let you take a handful of sticks without worrying about them drying out or getting damaged. 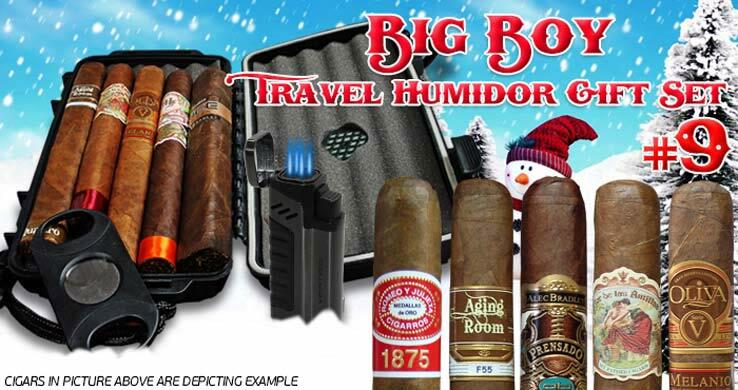 Mikes Cigar is offering a great deal on a hard shell, five cigar travel humidor that comes with a cutter that handles up to 64 gauge cigars, a quad-flame torch that sells elsewhere for about twenty bucks, and five great cigars, for $49.99. These kinds of deals aren’t uncommon, but what makes this one unique is you get to pick the cigars. He’s got eleven different combos to pick from. The page is a bit garish, but at this price, who cares? It’s a perfect gift for your cigar smoking friends, or even yourself.